Director – Jay Oliva, Screenplay – J.M. DeMatteis, Music – Frederik Wiedmann, Supervising Animation Director – Toshiyasu Kohawa, Animation – The Answerstudio. Production Company – Warner Bros. Animation. Damian is now living at Wayne Manor but Bruce is having difficulty controlling his determination to go out crime-fighting on his own. During one such sojourn, Damian is witness as a mysterious figure in an owl costume appears and kills the villain known as The Toymaker. Bruce initially blames Damian for this. This causes a division between them and Damian becomes even more determined to go out on his own. The owl figure, known as Talon, appears to Damian, urging him to break free from Batman and give in to his urge to kill those who deserve it. Investigating on his own, Batman finds they are up against what was believed to be a mythical secret society known as the Court of Owls. The Court inducts the young into its ranks and has eyes and ears all across Gotham City, as well as an army of warriors kept in suspended animation. Bruce is abducted and taken before the Court who want in on his plans to rebuild Gotham City. As he makes all effort to penetrate the Court’s secrecy, they are determined to sway Damian to their ranks and turn him against Batman. Batman vs. Robin was the 22nd of the DC Universe Original Animated Films. It joins Superman: Doomsday (2007), Batman: Gotham Knight (2008), Justice League: The New Frontier (2008), Green Lantern: First Flight (2009), Superman/Batman: Public Enemies (2009), Wonder Woman (2009), Batman: Under the Red Hood (2010), Justice League: Crisis on Two Earths (2010), Superman/Batman: Apocalypse (2010), All-Star Superman (2011), Batman: Year One (2011), Green Lantern: Emerald Knights (2011), Batman: The Dark Knight Returns Part I (2012), Justice League: Doom (2012), Superman vs. The Elite (2012), Batman: The Dark Knight Returns Part II (2013), Justice League: The Flashpoint Paradox (2013), Superman Unbound (2013), Batman: Assault on Arkham (2014), Justice League: War (2014), Son of Batman (2014), Justice League: Gods and Monsters (2015), Justice League: Throne of Atlantis (2015), Batman: Bad Blood (2016), Batman: The Killing Joke (2016), Justice League vs Teen Titans (2016), Batman and Harley Quinn (2017), Justice League Dark (2017), Teen Titans: The Judas Contract (2017), Batman: Gotham By Gaslight (2018), The Death of Superman (2018), Suicide Squad: Hell to Pay (2018), Justice League vs The Fatal Five (2019) and Reign of the Supermen (2019). Batman vs. Robin was the second entry in a trilogy of films concerning Bruce Wayne and Talia al Ghul’s son Damian. The film trilogy began with Son of Batman (2014) and culminated with Batman: Bad Blood (2016). The character of Damian had been floating around in comic-books since 1987 but was at first never given a name. Other writers took this up and gave the child a life initially in some of DC’s alternate world and future stories. However, it was with the story arc Batman and Son (2006) by Grant Morrison that Damian entered Batman Family canon where it was explained that he was born after Batman and Talia had a tryst in which Bruce had been drugged. Damian became a regular character soon after, even joining the Teen Titans at one point. Batman vs. Robin loosely adapts The Night of the Owls (2012), a DC event that managed to hold crossovers between eleven different titles in The New 52 line-up, including a massive backstory of the Court that went all the way back to the 17th Century. This offers a fantastic new nemesis for a film, even if we get a much more simplified version of the backstory and multiply threaded crossover storylines that we had on the printed page. The only disappointment with the film is the ending, which has one individual eliminating most of the society – it is an act that reduces the considerable shadowy mystery of the group to being little more than a flimsy country club. 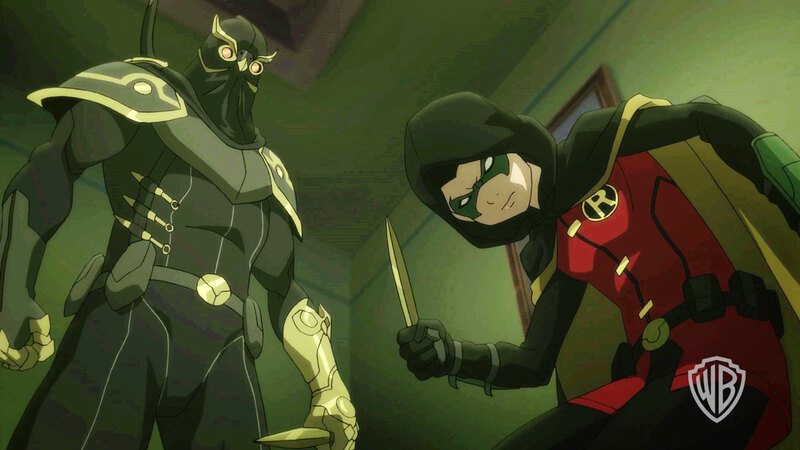 Director Jay Oliva’s contributions to the DC Universe Original Animated Films have tended to leave me with mixed feelings but Batman vs. Robin works well. The script creates a strong central conflict between a paternal Bruce and an impetuous Damian as he is swayed by Talon and the Court of Owls. Action has never been Jay Oliva’s forte but he does well with the various fight scenes and car chases. The fight between Batman and Damian over the skies of Gotham and the climax with the Court of Owls invading Wayne Mansion and the Batcave would have to count as some of Oliva’s best action sequences.